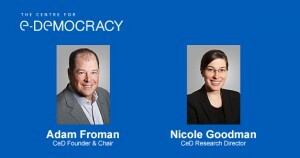 Dr. Nicole Goodman, CeD Research Director and Assistant Professor at the Munk School of Global Affairs, will share findings from her research, which seeks to address the question: What is the impact of Internet voting on local elections in Canada? during a free webinar at 2 p.m. on Thursday, January 29th. Nicole will discuss the benefits and challenges of using Internet voting in municipal elections from the perspectives of voters, candidates, and election administration, and how the inclusion of this technology is changing elections. Some questions that will be addressed include: whether Internet voting can encourage non-voters to take part, how it changes the nature of campaigns for candidates, and whether there are cost implications for electoral administrators. The webinar?hosted CeD Founder & Chair Adam Froman?will also provide some context regarding where Canada sits internationally with respect to electoral modernization. We hope you will join us for this presentation. The Centre for e-Democracy is a charitable organization committed to the translation and dissemination of academic research. We are currently raising money to develop a research hub to facilitate knowledge engagement with the general public. 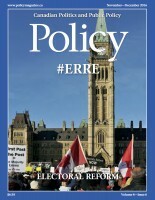 Donors contributing a minimum $50 donation to the Centre on or before January 31st will receive an advance copy of the Internet Voting Report prior to its release in February 2015. Help us achieve our vision and donate now. Unfortunately I was not able to attend the webinar is it possible to get the presentation and resulting discussions?